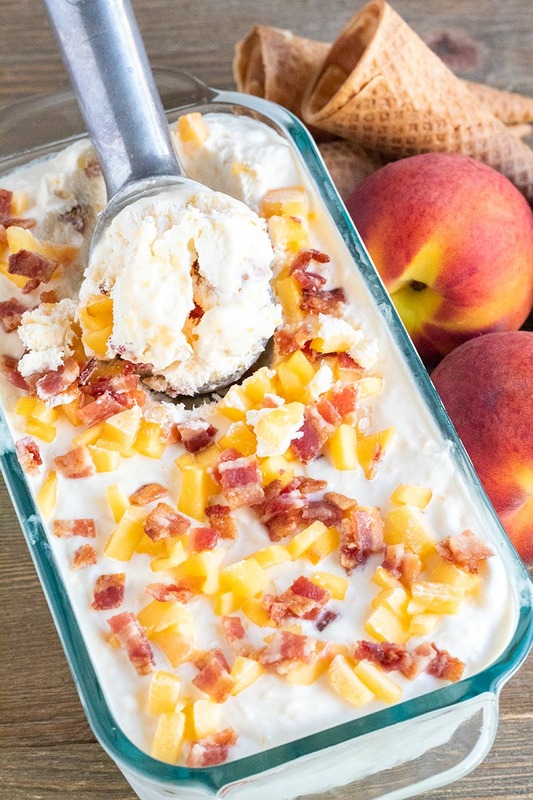 Bacon Bourbon Peach Ice Cream takes fresh summer fruit & turns it into a gourmet ice cream you can make at home! So good it’ll make you weak in the knees!! This ice cream is a little dream of mine. It’s also my first homemade ice cream ever. 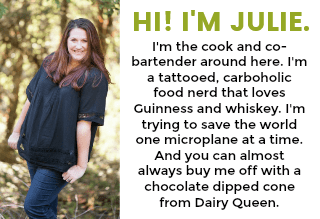 If I knew how easy it was, I would have stopped buying my ice cream at the store and starting creating my own fun flavors years ago! I wanted an ice cream that had bacon in it (because bacon), but I also wanted something summery (is that a word?! )…and boozy. Boozy treats make me smile and giggle to myself. I threw everything together, crossed my fingers, because the ingredients make sense, but you never really know until you take a big bite. This ice cream is amazing. It’s super creamy with an amazing mouthfeel. I love the bits of peaches and the salty pops of bacon. And the whiskey? You get this perfect hint of the whiskey. I couldn’t have asked for a better first ice cream. Just be sure to cook your bacon nice and crispy so it holds up during the freezing. Hello, summer! With summer in full swing, there’s nothing I want more than an ice cream cone to cool down. 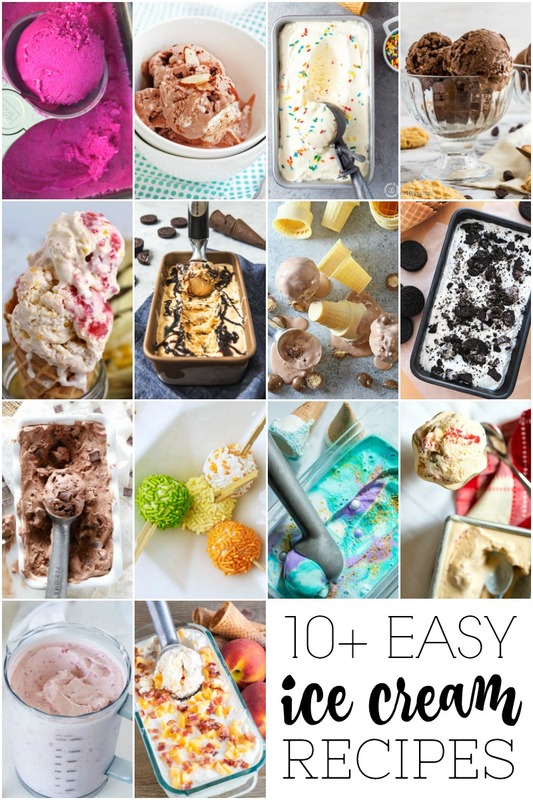 Luckily we have over 10 crazy good super easy to make ice cream recipes to share with you this month! 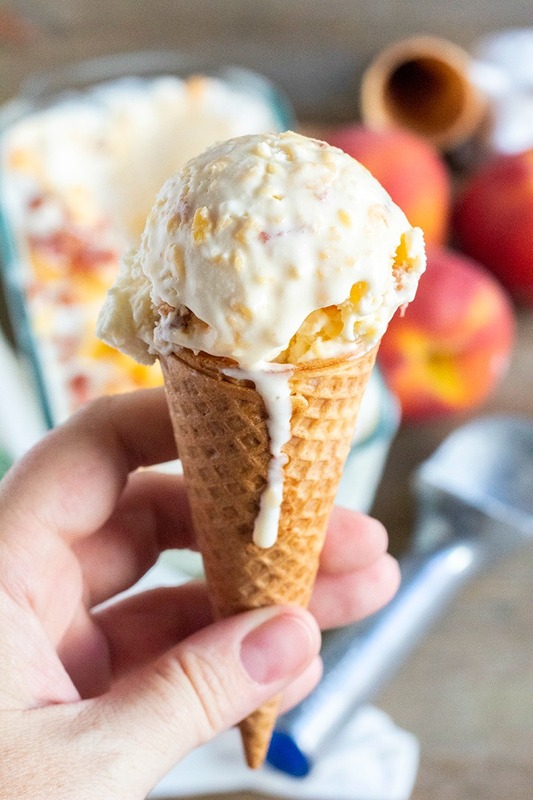 Bacon Bourbon Peach Ice Cream takes fresh summer fruit & turns it into a gourmet ice cream you can make at home! So good it'll make you weak in the knees!! Preheat oven to 400 degrees F. Line a baking sheet with a silicone mat or foil. Coat bacon strips in brown sugar on both sides and lay flat on the baking sheet. 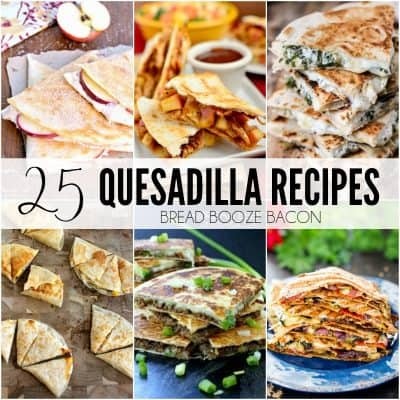 Bake for 15 to 20 minutes, or until the bacon is crispy. Remove from the oven and transfer to a pate that's been sprayed with non-stick cooking spray to let the candied bacon set up. Once cooled, finely chop the bacon. While the bacon cooks, Place heavy cream in a large mixing bowl and beat on high speed until stiff peaks form. Set aside. 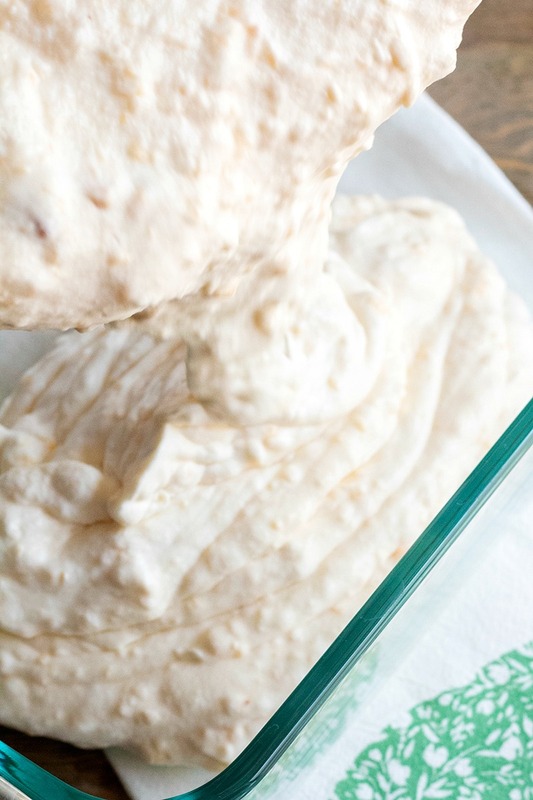 Add the peach mixture to the whipped cream and fold together until combined. Add the bourbon and 2/3 of the bacon to the ice cream base and stir to incorporate. Pour the ice cream base into a 1/5 quart loaf pan. (There may be a little more base than can fit, it's happened to me before.) 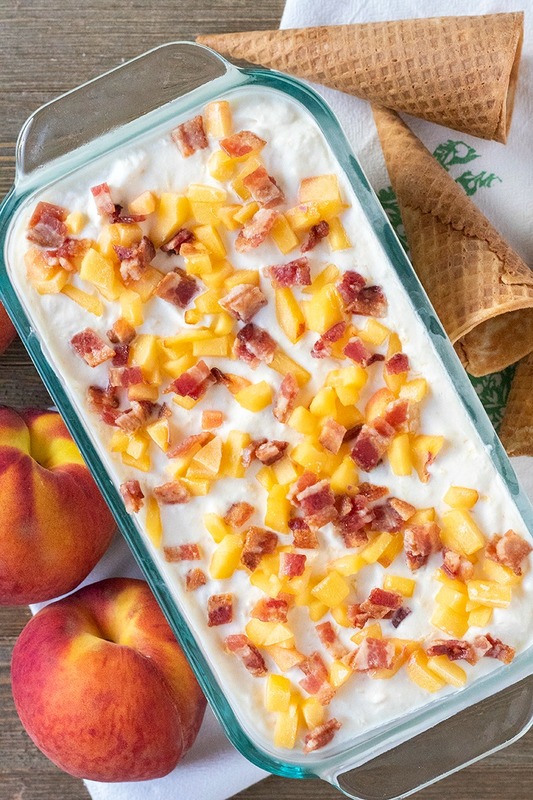 Sprinkle the reserved diced peach and remaining bacon on top of the ice cream base. Freeze for 6 to 8 hours or until set. Girl, you’re killing me with this. It’s genius! I can only imagine how flavorful this is! Looks fantastic!